Sevilla climbed to fourth in LaLiga with a thrilling 3-2 derby triumph over city rivals Real Betis on Sunday (AEST). 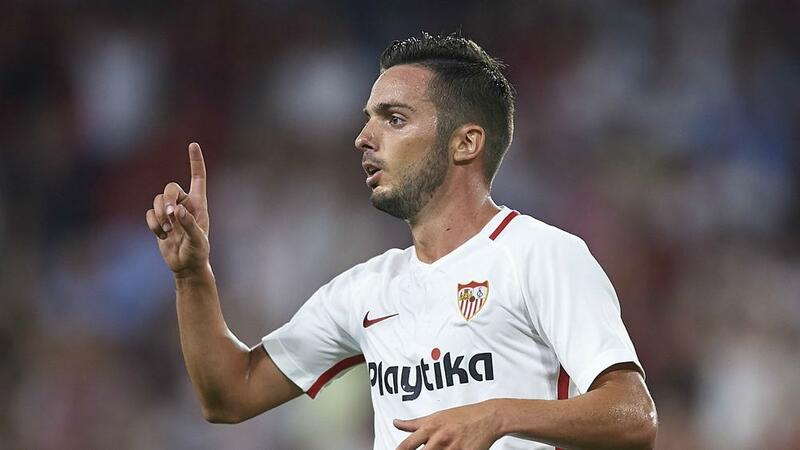 Pablo Sarabia scored one and set up another at an electric Ramon Sanchez-Pizjuan Stadium to lead Joaquin Caparros' side above Getafe in the fight for Champions League qualification. Betis is hoping to pip its fellow Andalusian outfit in the race for fourth, but fine second-half goals from Giovani Lo Celso and substitute Cristian Tello proved in vain here as it lost for the third time in five matches. Exciting winger Sarabia supplied the cross for Munir El Haddadi's volleyed opener midway through the first half and was one of three scorers in an incredible eight-minute period after the interval. The 26-year-old restored Sevilla's lead moments after midfielder Lo Celso's 55th-minute equaliser, before Franco Vazquez netted what proved the winner with a thumping left-footed drive from outside the area. Tello's sublime free-kick again reduced the margin to a lone goal late on but the hosts survived more than five nerve-wracking minutes of added time to move nine points clear of Quique Setien's men, who remain ninth.